→How to Use a Veggetti: Do It Like a Pro! The Veggetti set comes with a thin spiral, a thick one, and ribbon cut blades. They all fit perfectly in the device as two of them are beneath and one of them is already inserted and is ready to cut vegetables. You can disassemble it for proper storage, as well as f﻿﻿or ﻿di﻿﻿shwashing. Do you own one but don’t know how to use a Veggetti? Read this detailed post on how to use this device and you can now make vegetable pasta for you and your family’s enjoyment. With the basic knowledge and the required materials, you can do this task a lot easier. As you are now handling food, it is mandatory that you wash your hands first with clean water. By doing this, the cleanliness of your vegetables will not be compromised. Peel off the skin of the vegetable but remember to leave the skin on one end for you to grip. With this, the vegetable will allow you to have a stronger and solid grip. It will also prevent having a slippery surface to grip on while you twist the vegetable inside the Veggetti. Here are some of the ﻿﻿vegetables﻿﻿ that work best using a Veggetti: carrots, zucchini, cucumbers, yellow squash ﻿﻿and ﻿potatoes. You may simply grip one end of the vegetable with your hand as you slide it into the Veggetti. Veggetti includes a spike-filled cap that helps you take a solid grip of the slippery vegetable. It should be noted that this works best for dense vegetables such as carrots but it may not be suitable for soft vegetables such as zucchini. The spike-filled cap will shred up to the very end of the soft vegetables, which may be difficult to push in the device for some. In order to get up to the last inch of goodness out of your vegetable, you may opt to use a fork to stab the vegetable instead of using your hands. The cutter inside the Veggetti would look like an hourglass with open top and bottom. Either of the sides has a different blade so that you can make alterations on the type of vegetable pasta you want. You may either choose from spaghetti-type or even wider, udon-like strands. Thinner strands work best for denser vegetables such as beets and carrots. However, thicker strands are suitable for soups, or any dish that requires thicker sauces. 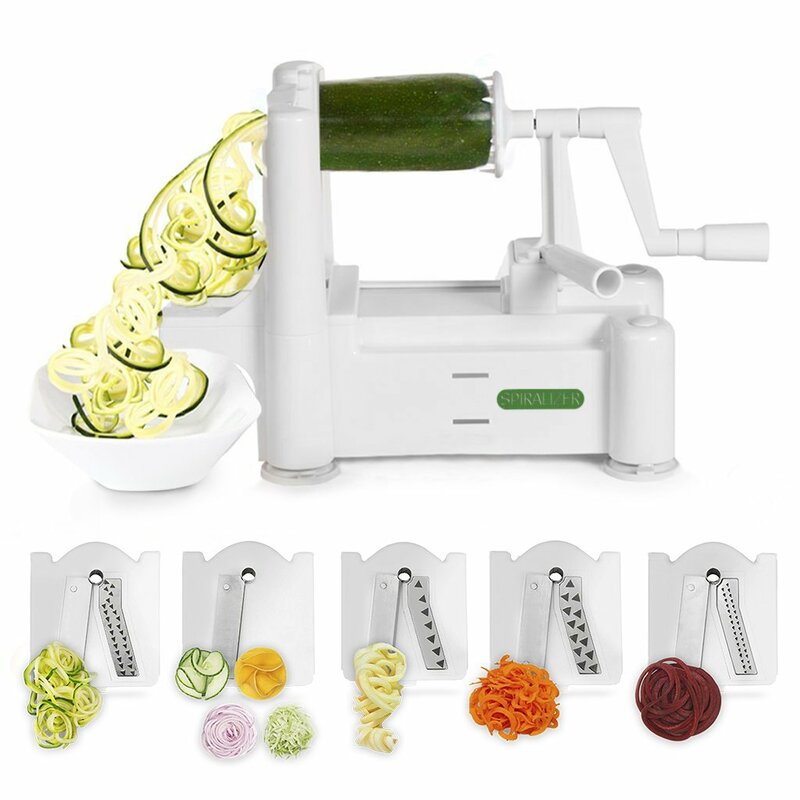 Once the vegetables have been cleaned, peeled or scrubbed, place one end that you want to cut inside the Veggetti and you may now begin twisting it into the device. If you know how to sharpen a pencil, this is how it usually works. Pasta strands will now begin appearing as soon as you twist the vegetables. Just remember to have a bowl ready where you can place the strands. You may choose to discard the leftover portion of the vegetable. You may also save it for later use such as enriching the contents of your soup or sauce. You have to always remember to keep your hands away from the sharp blades. This device is known to cut skin if the user is not careful. The safest possible way to do this is to make sure that the vegetable you are twisting is dry and firm. To add, you may stab the vegetable with a fork to have a more solid grip. Once the strands are in the bowl or plate, you may use power towel to dry off the moisture from the vegetables. They may be very watery and would not be a good additive to your dish. Different types of vegetables may warrant different kinds of approach. Here are some tips to effectively turn specific vegetables into pasta. 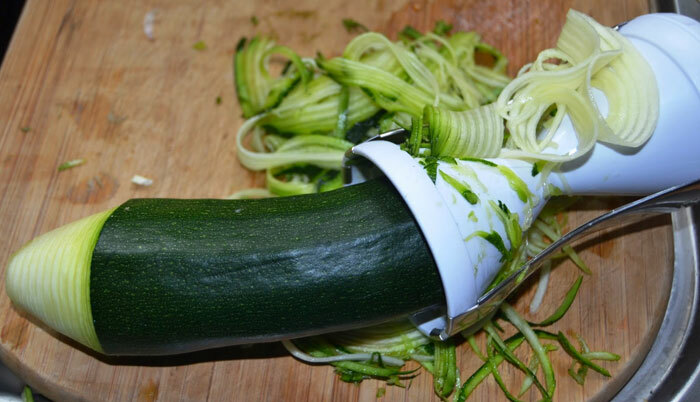 Zucchini – You may leave the stem on. This is okay to do as you can have a better hold of the vegetable as you do the twisting. By doing this, you can use your hand instead of using the cap or a fork. Carrots – You can hold the thinner end of the vegetable as the thicker one slides inside the Veggetti. This way, you can make sure that you can use more of it and not waste the vegetable. This would also work for all other vegetables that are cone-shaped. Eggplant – Thicker blade must be used because thinner strands are more breakable than thicker strands. It should be noted that eggplant noodles are very fragile and they might break easily. Aside from the instructions presented above, you may also check the below list of tips you can incorporate while using the Veggetti. This may be very useful information to make your dishes more delicious. As opposed to the instruction manual that comes with the Veggetti, you may hold the device a little differently from the pictures shown in the manual. The twisting process tends to produce a lot of unnecessary vegetable matter and it may get a bit messy. You may instead cup the end of the Veggetti your one hand while you twist with the other. This will allow you to catch the vegetable matter in your palm for easy elimination. You may choose to get the Veggetti Pro instead of the standard one, as it is a lot safer to operate. There is a lesser need for your hands and fingers to come close to t﻿﻿h﻿﻿e sharp blades. You may clean the Veggetti using your hands but with the blades’ sharp nature, it is a relief that you can have this device washed on the top rack of an automatic dishwasher. If you do not have a dishwasher, you may instead use a high-pressure spray handle attached to the sink. Just to emphasize, do not get your fingers anywhere close to the blades. A first aid kit should always be ready in case you cut yourself while cleaning the Veggetti. As mentioned above, leave an unpeeled portion of the vegetable so you won’t get cut. The manual does not have this instruction so you have to be very careful. Again, do not attempt to forcefully insert the entire vegetable into the Veggetti or the blades will cut you. Using this extremely convenient device is very easy. You just have to follow the above instructions in order to successfully turn your vegetables into pasta strands. Being armed with this useful information will allow you to enjoy more of your vegetables. Did you enjoy reading this post? If you own a Veggetti and would like to add more tips and information, please leave a comment below.